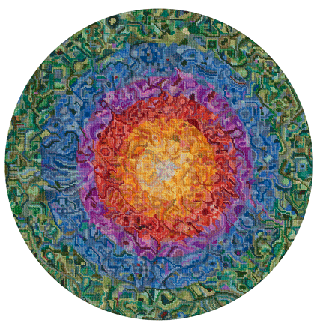 Ralph Wileman brings a refreshing modern view to needlepoint as fine art. Wileman describes his artistic process as "painting with a needle and yarn, instead of with a brush and paint." Wileman calls his work needlepointillism, original needlepoint works created with a minimum amount of sketching, drawing or coloring on the needlepoint canvas prior to stitching with yarn. Forms and colors evolve on the canvas much like forms and colors evolve in the paintings done by many contemporary artists. Needlepointillism engages the needlepoint artist at every point in creating original works. The classic needlepoint tent stitch is " the point " in " the ism". See examples of this fine art and examine the stitchery in the closeups provided on the gallery page of this site. These are just a few of Ralph's many pieces because he actively continues to pursue this work. A large number of Ralph's work were on display in the fall of 2012 at the Horace Williams House, located in Chapel Hill. This one-man ehxibition was sponsored by the Chapel Hill Preservation Society. For a video tour of this event, see this link. It provides you with an opportunity to compare and constrast Ralph's needlepoint work to a few of his earlier works in the paint medium; the video also gives you a nice feel for the historic setting for this unique show.